Click a photo to locate the artwork on the map and to view more detail. Fruits of the Garden Photographer: M Anderson A bronze sculpture featuring an apple atop a female torso framed by 3 ferns. Plains Pioneer Photographer: M Anderson Commissioned to mark the 100 year anniversary of the land ballots in the Hauraki Plains. The sculpture represents the workers who dug the enormous Plains drainage system by hand thus allowing the previously swampy alluvial plains to be converted for use as farm land. Featherweight Photographer: M Anderson Outside the Academy of Performing Arts at the Waikato University is this 3m high representation of a Huia feather. The bronze sculpture was created in 2004 by Paul Dibble as a monument to the cultural significance of this extinct native bird.the feathers of which were prized by high ranking Maori chiefs and their families. Ghost of the Huia Photographer: Palmerston North City Council Paul Dibble's Ghost of the Huia sculpture is a tribute to the memory of the extinct huia. A unique native bird, the last confirmed sighting of a live huia was in the Tararua ranges in 1907. The sculpture was installed in this central location for public enjoyment by Dibble Art Studio and Zimmerman Art Gallery. 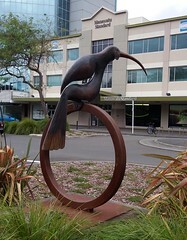 The huia is made of bronze, and the base of the sculpture is made from Corten steel. Kereru Photographer: Whanganui District Council Sculpture featuring a Kereru, also known as a native woodpigeon, a sphere and foliage motif. 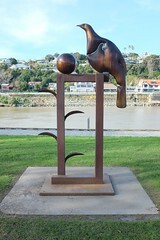 Paul Dibble's Kereru was a finalist in the 2010 Sculpture Wanganui competition and received the Powerco Wanganui Trust People's Choice Award, which was voted for by the Whanganui community. 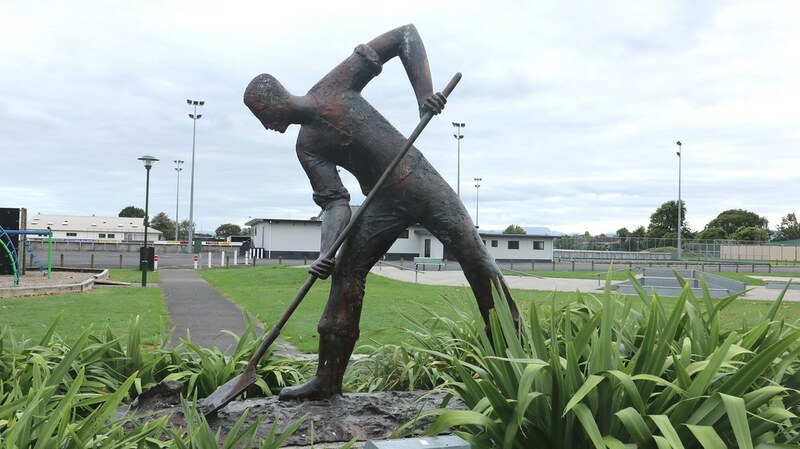 The sculpture is now sited on Taupo Quay alongside the banks of the Whanganui River. Who's Afraid Photographer: jandalsandtogs.blogspot.com Commissioned by the Palmerston North Public Sculpture Trust, this dramatic work is ideally suited to stand outside the Regent Theatre, the City's centre for performing arts. The sculpture comprises two contrasting pieces. 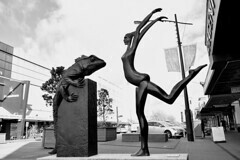 The dancer, smooth and agile, stands at 3.5 metres tall. She boldly faces off against the challenging tuatara, undaunted in her performance by the tuatara's steely gaze. Pacific Monarch Photographer: Palmerston North City Council This 4.4 metre-high bronze sculpture was commissioned by the Manawatu Art Gallery Society, using bequest funds from the estate of Palmerston North citizen Gertrude Raikes. According to the Palmerston North-based artist, Pacific Monarch is a monument to all the people who have settled in Palmerston North and who have brought aspects of their culture with them. The figure's headdress is intentionally ambiguous it could be a ceremonial Pacific crown of leaves, or the headdress of the green men of Celtic Europe. The figure's blindfold represents the way people immigrate to a new country without knowing what they will find there or what the future may hold. The long voyage made by many settlers is represented by barnacles on the figure's stern-like thigh, and also by the globe balanced in one of the figure's hands. In the figure's other hand is a plumb-bob (a builder's tool for vertically lining up framing), demonstrating an intent to settle and make a home. But first efforts can be rough and ready, using whatever comes to hand, and so the figure is propped up like a fencepost by two spindly sticks. All Creatures Great Photographer: Palmerston North City Council Commissioned by the Palmerston North City Council, the concept of All Creatures Great was drawn from a children's book which demonstrated the size of a whale as equal to the height of 10 elephants. On one side, the whale rises on its tail from an atrium pond, while on the other side the elephants are stacked on top of each other. These two endangered species together support a lintel, on which rests an oversized arm holding a plumb-bob. The work is a comment by Dibble on the power mankind has over nature; the future of the world's largest land and sea mammals lies in our hands. In this way, the work combines notions of protection, preciousness and the precarious balance of nature. Paul Dibble was born in1943 and raised on a farm in Waitakaruru, his early education occurring at Thames High School. Having shown an early talent for drawing and with guidance from his family Paul chose to further his education in the arts. He trained at the Elam School of Fine Art at the University of Auckland graduating in 1967 with a Diploma of Fine Arts with Honours in Sculpture. 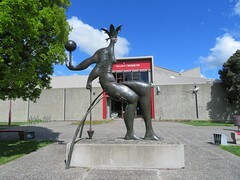 Knowing that making a living in the arts in the 1960's would be a struggle he accepted a post as lecturer in painting and sculpture at the Palmerston North College of Education. 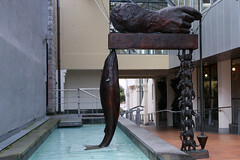 He started exhibiting his works from the early 1970's but it wasn’t until a decade later that recognition of his works made it possible to turn his craft into a full time career though he continued as lecturer in the arts at Massey University until 2002 and later in 2007 received an Honorary Doctorate in Fine Arts from the University. Pauls large scale sculptures can be found in many centres around New Zealand from Otago, Wellington and Napier but his most recognised commission is The New Zealand Hyde Park Corner Memorial in London. Paul Dibble was appointed as a Member of the New Zealand Order of Merit for services to the arts in the 2005 New Year Honours.